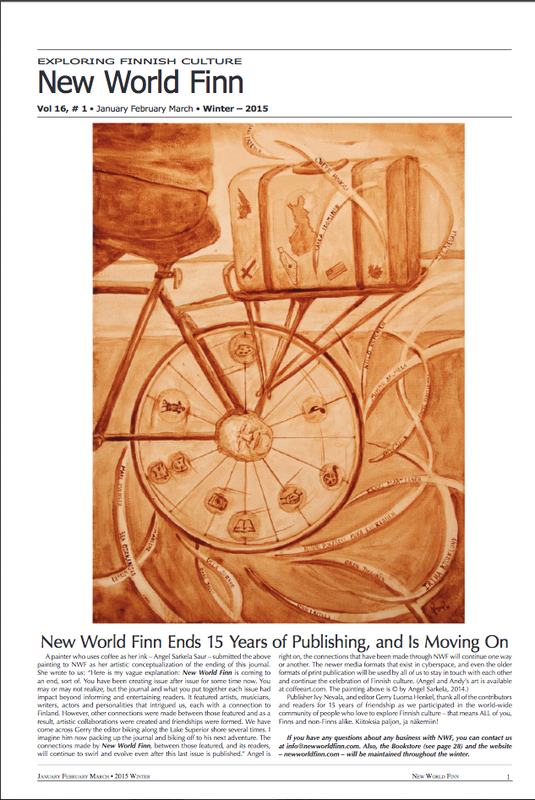 My tonttu-inspired story “Confabulation” was featured in the last issue of New World Finn. Every issue of the journal has been full of stories and music and a celebration of Finnish and Finnish-American life. I am sad to see this publication end, but nothing lasts for ever, alas. Publisher Gerry Henkel was one of the first ardent supporters of my stories, publishing a number of the tales that ended up in Unikirja. That book is out of print, but soon will reappear as Dream Book from Fox Spirit, with a swank new cover by S. L Johnson and a couple new stories including “Confabulation” too. I’m glad I had a chance for a final farewell with NWF and Gerry. Gerry also made my very first kantele, Louhi, so I have even more reasons to be grateful to him. I reconnected with a part of my past that I’d left behind when I left Michigan. Since then I have also connected with my cousins in Finland, a great source of joy. And does it get more joyful than music? Not only did I have fun playing my kanteles (yes, I have a few though not yet the red 15-string electric I want), but I was part of a group for a while, Louhi’s Daughters, and have expanded my musical fun with all the drumming and percussion that I love so much. But it never would have happened without Gerry. Sisu and kiitos paljon, Gerry. Previous Post Celebrate Brigid’s Day with Hard-Boiled Witch!